Top Kiwi athlete Dougal Allan reports on his win at Australia’s premier multisport race the Augusta Adventure Fest. With a new event format spread across two days, some things remained the same with the 2018 Augusta Adventure Fest. 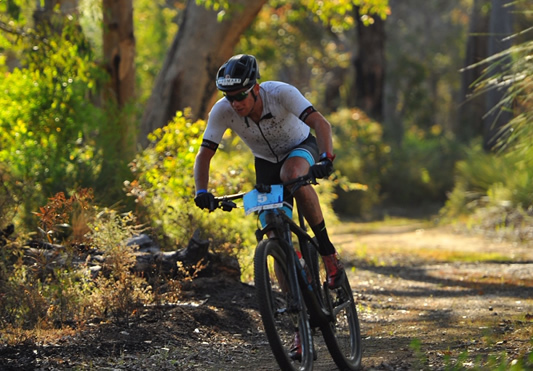 The world’s largest adventure race still involved the four sports of swim, kayak, trail run and mountain bike and the event was still hosted by the picturesque South West Australian town of Augusta. Some parts of the world have a unique ability to inspire the best in me and every time I arrive in Augusta I am met with an immediate and building urge to explore the waters, trails and beaches that surround and characterise this place. After a successful trip in China (winning both our team adventure races) I was excited to travel directly to Perth (which happened to be on the same time zone) and settle in with my brother-in-law Andy for a couple of nights being hosted by John who is a multisport athlete I have coached for many years. We made the 3-hour drive down to Augusta on the Thursday evening and spent Friday loosening the legs by exploring the mountain bike trails and surf paddling on the shore break in our kayaks. We felt like kids at one of those all-time favourite playgrounds, loving every moment. Although we had to keep things in perspective as racing started in one more sleep! 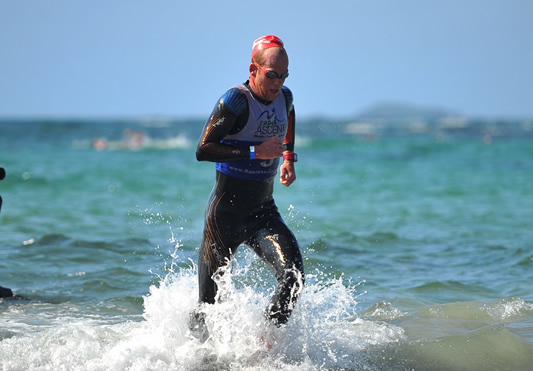 Saturday was the start of festivities and this year involved four standalone events in the form of a 2km ocean swim, 15km ocean kayak, 16km trail run and 35km mountain bike. Each event was spread out enough to allow competitors to refuel and prepare for each event in isolation, but in a short enough turnaround that those doing multiple events were kept busy and focused through the day. There was little time for boredom and I really found myself loving this unique and innovative race format. I had a reasonable swim and came through in the top 10. The paddle was a little outside my comfort zone given I hadn’t done any ocean paddling in a couple of years and I probably got a bit ambitious with my kayak choice, but I enjoyed the challenge and was pleased to stay upright throughout and come home in the top few individuals (although comfortably beaten by a few gun team paddlers!). 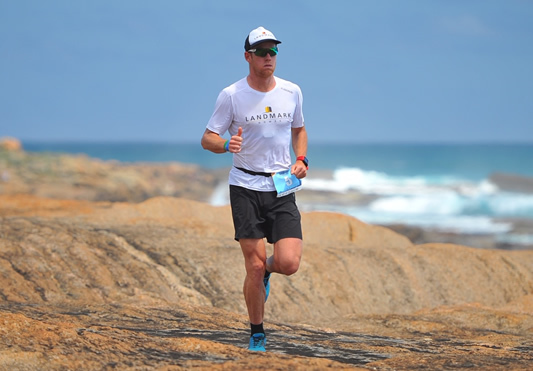 The run was a real highlight with a spectacular start line set at Cape Leeuwin Lighthouse leading runners onto a mixture of rocky and sandy trails that meandered along the coastline and overlooked the Indian Ocean, before turning inland for some beautiful bushland and challenging trails back to finish in Augusta township. Andy gave this event a good crack himself after spectating the first couple events and I was the first runner home which shot me into an assertive position for the overall title. All that was left was a 35km mountain bike that involved a mix of roads, trails, sand, bushlands, climbs and descents and culminated in another wonderful finish line experience back in Augusta. I was having a good battle with another rider when about 25km into the race he had started to pull slightly ahead. He took a wrong turn which I spotted but I carried on in the direction I knew was correct. Once I spotted him behind me towards the finish I knew the only right thing to do was to pull over and let him take line honours as he was clearly the strongest of the two of us. It seemed to draw a few compliments at the finish for sportsmanship which was nice, but to me it was a simple and logical decision. I was rewarded for my consistency across the day by being crowned the overall winner for the Saturday ‘Adventure Warrior’ event. The next and final challenge would be to string the four sports together in a slightly shorter and non-stop format the following day in the flagship Adventure Race event. I was feeling a bit jaded by the four Saturday events, so I was anxious to know how my body would respond the next day. As it turned out I had a great race on the Sunday too and managed to take the overall line honours (beating the teams in the process). I had ground to make up after the 1km swim and 6km run but managed to move into the lead on the 15km mountain bike and held on through the 6km inlet paddle to the finish. It was a hugely engaging race with plenty of terrain variation and the challenge of transitioning through four different sports in less than two hours! The skill levels required for the Sunday event were noticeably less than the Saturday, which made good sense as it opened the door to a wider adventure sport audience to be involved. I loved seeing young school aged kids alongside retired grandparents and everyone in between getting stuck in. The support out on course was exceptional and felt really interactive. I enjoy most finish line experiences but there is something special about the having a cold beer in the warm West Australian sunshine and this finish line is extra memorable. For any of my kiwi friends looking for an excuse to explore Western Australia, check out the Augusta Adventure Fest set to take place on the first weekend of November 2019. Perth is an easily accessible airport with several direct flights available from NZ and is only a 3-4-hour drive from Augusta. 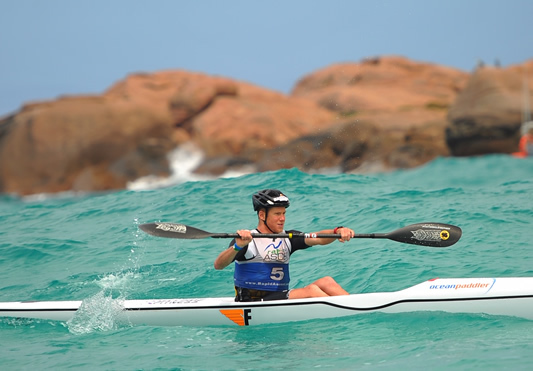 There is much to see, do and explore in the townships, beaches and trails that connect Perth and Augusta and hiring kayaks and/or bikes for the event is easily achieved too. If anyone fancies the idea of including these events in their calendar for next year I’d invite you to check out the event website www.AugustaAdventureFest.com.au or get in touch and I would be happy to help with ideas and suggestions on how you can make it happen.